In the weeks leading up to the 36th Mill Valley Film Festival, organizers proudly touted the fact that each of the past five Academy Award winners for Best Picture screened at the 11-day festival. They might be able to make it six. 12 Years a Slave, the new film from acclaimed director Steve McQueen, screened at the Rafael Film Center Friday night. The film is based on the 1853 autobiography Twelve Years a Slave by Solomon Northup, a free black man who was kidnapped in Washington, D.C. after being lured from Saratoga Springs, New York in 1841 and sold into slavery. He worked on plantations in Louisiana for 12 years before his release. “This is a film for the ages – we know that,” MVFF Founder Mark Fishkin told the audience in introducing 12 Years a Slave. The film tells Northrop’s story in brutal detail, and McQueen told the audience afterward that he let the camera stay on several devastatingly brutal scenes for long stretches so as not to “give the audience any breathing room” from the subject matter. “I wanted to make a film about slavery because I felt in the canon of film, this particular subject had not been tackled,” McQueen said, noting that he believed Northrop’s book belongs on school curriculums as much as The Diary of a Young Girl by Anne Frank does. 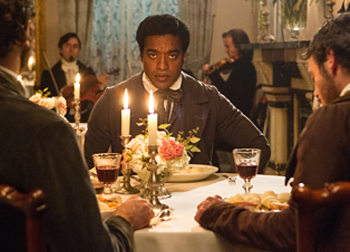 12 Years a Slave hits theaters on Oct. 18. Click here for more coverage of the Mill Valley Film Festival.